In 2007 and 2008, Baile Mutambue, an agronomist with the National Rice Program in DRC, reported that SRI methods have been tried for several years in Kinshasa, Mbandaka, Kikwit, Mbanza-Ngungu, and Kisangani and have successfully increased average paddy yields from 1 ton/hectare to 1.5 or 3 tons/hectare. In 2013, the Italian NGO, Mazao, trained farmers in SRI methods in the Tanganyika district of Kalanga province, with experimental fields receiving yields as high as 9 tons/hectare. 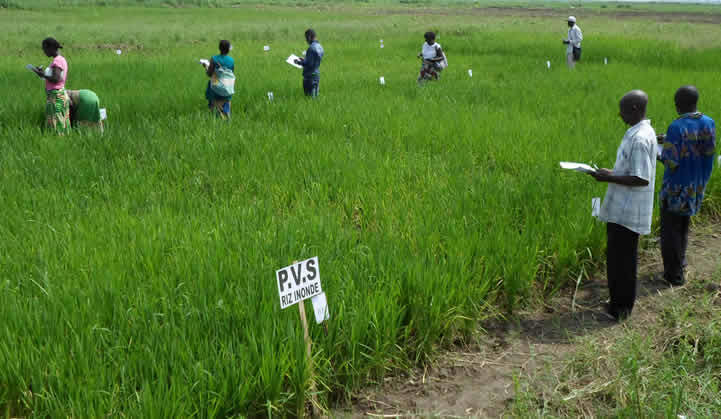 Also in 2013, the NGO BATIDE collaborated with the National Rice Program and the European Cooperative for Rural Development (EUCORD) to conduct SRI trials in Kingabwa, in the western part of the country, which reported yield increases with SRI of 64-121% with four rice varieities. The project was renewed with phase II running 2015-2018. To the east, in the Ruzizi plain of South Kivu, the Belgian NGO VECO has begun teaching SRI methods to farmers, with photos and results posted on their facebook page. Finally, during 2016, a report from the US-based Woods Hole Research Center describes the onset of a project (Projet Équateur) in the DRC's northern Equateur province to study the possibility of using SRI methods to make use of a degraded swamp area. Mid-2016 project results record tripling of rice yield, though finding labor to construct and work in paddies while converting from slash-and-burn agriculture has slowed SRI adoption; Projet Équateur is hoping to use REDD+ funds to reduce agricultural extensification. During December 2016 and January 2017, the NGO Mazao reported on their success using SRI methods in an economic development project with a sizeable Pygmy population in conflict areas in Kalemie, Tanganyika province. [June 2017] The Kingabwa Rice Intensification Project phase II (PIRK II), which began in 2015 and is slated to run until 2018, is a is a continuation of the 2011-2015 Rice Intensification Project funded by USAID. The project partners are Winrock (lead), BATIDE, National Rice Programme, National Nutrition Programme, Kingabwa Farmers Association and Cooperative. In the second phase of the project, the European Cooperative fro Rural Development (EUCORD) continues to build on the existing relationship with local NGOs and the private sector partner. The goal is to develop 120 ha of irrigation land in the Malebo pool, demonstrate SRI, and support the development of a brand for Kingabwa rice (“Ngwele” rice) to improve marketing. "After so much work, the first results can now be seen!" [January 26, 2017] According to an article in the January 2017 Mazao Newsletter, SRI training in Mazao's SRI Project in Kalemie, D.R. Congo, has led to visible results only two months after sowing: The ears of rice grown from each seed have literally doubled in 80% of fields compared to rice cultivated with traditional techniques. While before the plants accounted for an average of 30 ears, now plants 60-70 ears. Barring any unforeseen events, the farmers are expected to harvest at least 5 tons of rice per hectare. Field staff and farmers have been congratulated! [December 16, 2016 ] The first phase of the NGO Mazao's Agro-ecological Rice Supply Chain Programme concluded during December 2016. Eighteen hectares of paddy rice were planted in Kampunda using the SRI methods. The Provincial Minister of Social Affairs and the Family lauded the rice program, which is being carried out in partnership with WFP-PAM, for the significant contribution it is making to the local agricultural development and especially to peace and stability of this area. [August 10, 2016] “It has to be cost effective. It’s not about some expensive technology, it’s about appropriateness and cost effectiveness,” says Dr. Glenn Bush, Woods Hole Research Center's (WHRC) Projet Équateur’s principal investigator. The northern province of Équateur is not only the most forested province in the country, but also the poorest; most of the people depend on the forest for their livelihoods. Bush cites SRI as an example of a cost-effective technology used by the project. He notes that, "It's success rate depends on how households manage their labor. New technologies pose a great risk to poor people. And anything that requires even a small outlay of cash is unattainable by many.” SRI had remarkable impacts with Projet Équateur trials, but it reportedly hasn’t enjoyed much widespread adoption yet, because at key times of the year family members that need to be recruited to weed, or to create a new paddy fiel, they have gone off to work in someone else's field or elsewhere to earn extra cash. Melaine Kermarc, WHRC's Projet Équateur manager, adds, "It’s also that people are unable to find the labor force necessary to create the paddy in the first place. It’s a huge initial investment. Once the paddy is there though it becomes a great incentive not to go further to deforest because they have regular income or food, with limited amount work in comparison to other crops. If the farming households can’t get to the point where they actually see the benefit, they will be unlikely to adopt a new technology, however promising." The Belgian NGO VECO has been experimenting with SRI methods on test plots and teaching farmers about them in the Ruzizi plain in South Kivu. Thirty farmer field schools participated in the trials, which resulted in average yields of 7.4 t/h. Photos of the farmers and fields can be found on the VECO Facebook page. In June 2013, the Italian NGO Mazao launched the "Likilimba of rice" SRI pilot project in the Tanganyika district, which established a Social Rice Supply Chain (SRSC) with intentions of reducing the gap between smallholder farmers and consumers. The pilot project provided training in SRI methods, which resulted in experimental fields achieving 9 t/h. Farmers participating in the trials increased their rice production from 0.5-1 tons/ha to 5-6 tons/ha. A video produced by Mazao explains their work with the SRSC and their SRI training. Basile Mutambue, an agronomist with the National Rice Program, reports that SRI methods have been tried in the DRC for several years now, with positive results. Average paddy yields are less than 1 ton/hectare in the country, according to FAO statistics, but with SRI methods, yields are 1.5 to 3 tons/hectare. The methods are being used in rice-growing areas around Kinshasa, Mbandaka, Kikwit, Mbanza-Ngungu, and Kisangani. They were introduced by technicians from China, according to Mutambue. EUCORD. 2017? Kingabwa Rice Intensification Project phase II (PIRK II) - 2015-2018. EUCORD website. Mazao. 2013. The Social Rice Supply Chain and Lilikimba Production. Mazao website. Photos of SRI farmers are available on the BATIDE website.